Built: 1934, Newport News Ship Building and Dry Dock Co., Newport News, Va. Hull Number: 358 Port of Registry: New York, N.Y. Owner: A.H. Bull Steamship Co. Inc., New York, N.Y.
Manuela rests at 160 feet, southeast of Ocracoke, N.C. 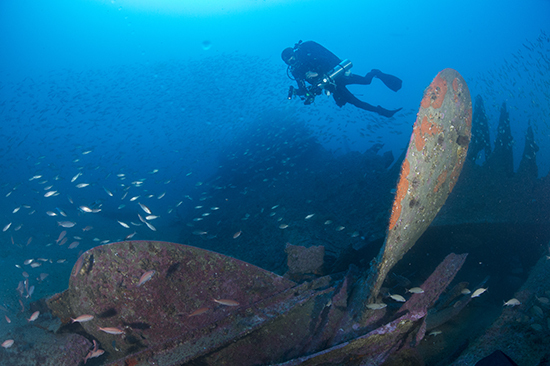 The wreck has some intact sections with high relief, but the majority is disarticulated. The wreck is lying on it starboard side and is broken into three main sections of high relief, the bow, a large hull section amidships and stern. 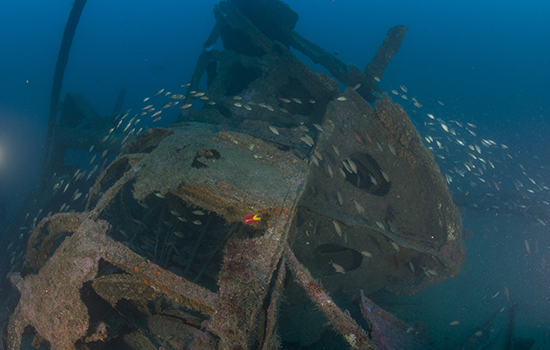 The bow is intact, lying on its starboard side and the anchor windlass and port side anchor are also visible. 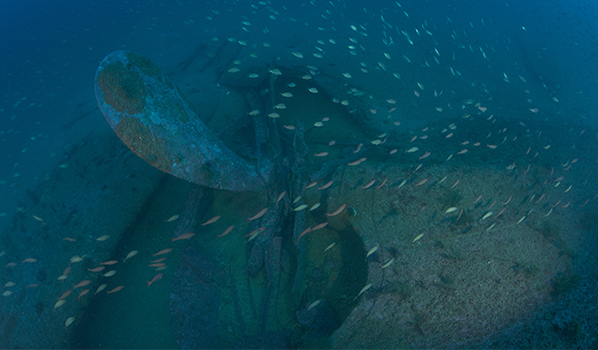 The stern section is also tilted on its starboard side with the rudder partially buried and a couple of propeller blades sticking up from the wreckage. 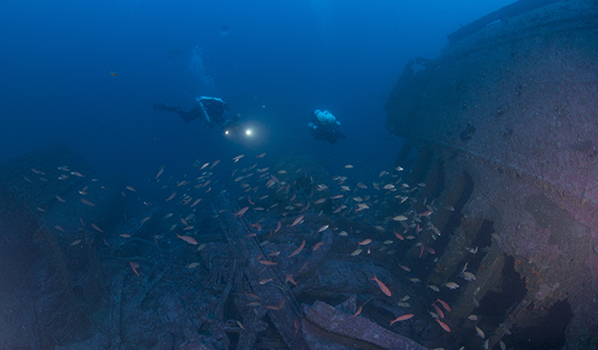 The remains of the engine and condensers are evident at the stern end area of this section. 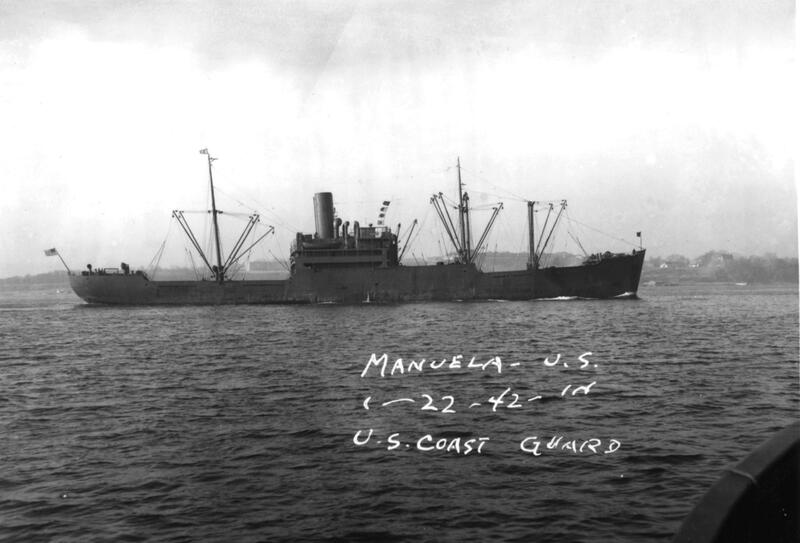 In late June 1942, Manuela was traveling with a convoy of 11 slower ships headed north from San Juan, Puerto Rico to New York. Although the freighter, carrying 100,000 bags of sugar, was fast enough to out run any submerged U-boat, it was ordered to travel with the slower vessels. 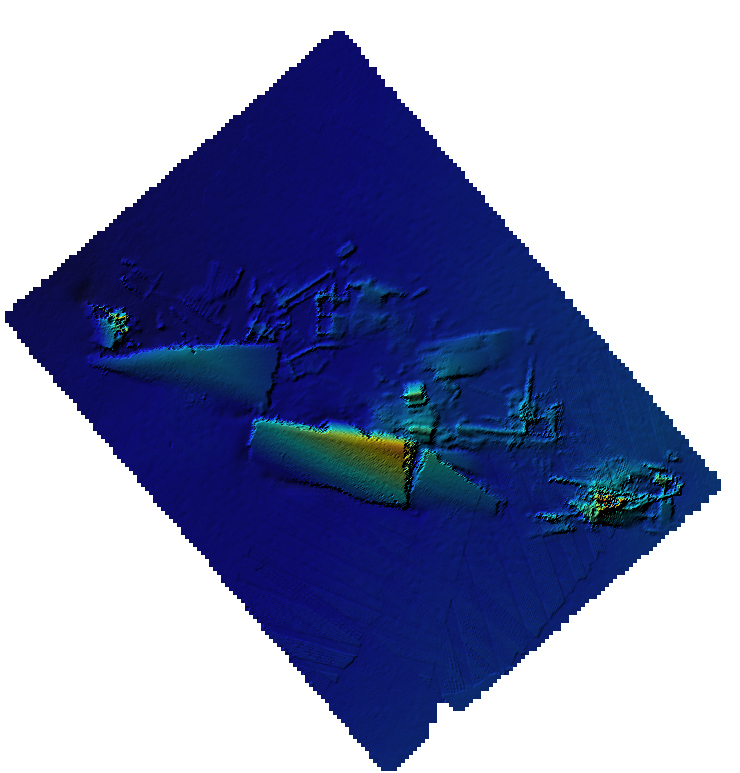 In the early morning hours on June 24, the convoy rounded Cape Lookout, N.C., where it was spotted by U-404. The U-boat captain fired a group of torpedoes towards the approaching ships. 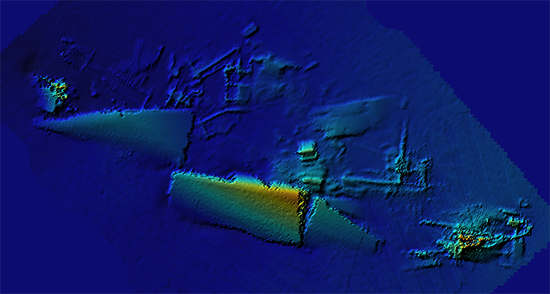 One torpedo struck the vessel Nordal, which eventually sunk. Several minutes later, another torpedo struck the starboard side amidships of Manuela, exploding and collapsing the bulkhead between the boiler and engine rooms. Two crew members were killed in the explosion and the compartments quickly filled with water. Manuela took on a definite starboard list and the captain ordered the crew to abandon ship. Twenty-three crewmen made it into a lifeboat and 17 others jumped overboard and climbed onto three life rafts. After 30 minutes, the men in the lifeboat were towed by USCG-408 to the armed trawler HMS Norwich City and taken to Morehead City, N.C. The 17 men on the life rafts were recovered by U.S. Coast Guard vessel USCG-483 and taken to the Naval Operating Base in Norfolk, Va.
Manuela remained afloat following the attack, and later that morning, a salvage crew from the U.S. Coast Guard vessel USCG-252 boarded the ship to prepare it to be towed. To their surprise, they discovered one seriously wounded crewman on deck, who was then taken to a hospital in Morehead City, N.C. The salvage tugboat, P.F. 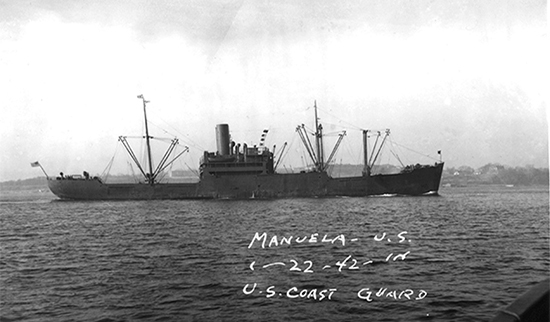 Martin, came alongside and helped in towing the half-sunk Manuela. They attached a tow line and attempted to drag the ship to shallow waters for later recovery. 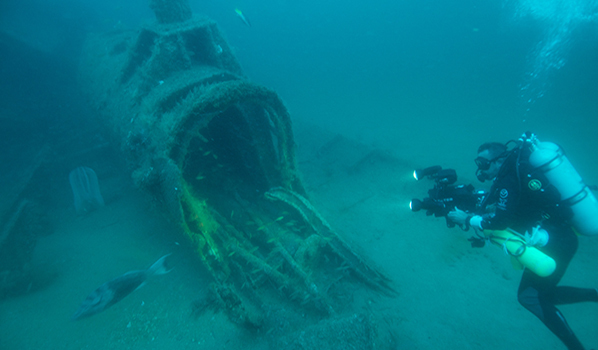 However, the next day as the vessel was under tow to Morehead City, N.C., it sank.